The Central Impact Area is located within Camp Edwards’ 2,200 acre Impact Area. This 330-acre area was the primary target area for artillery, mortar and other firing activities from the early 1900s until firing ceased in 1997. Initial investigations, including historic record reviews and geophysical surveys identified 49 potential mortar/artillery targets. RDX at levels up to 16 parts per million (ppm) were found at 35 targets. Perchlorate was found at levels up to 42 ppm. The soil around these targets and numerous unexploded or low-order munitions are considered to be potential sources. In 2004, a focused investigation/Rapid Response Action removed 800 tons of soil from two targets with high contaminant concentrations to help determine the effectiveness of such removals in reducing contaminant migration to groundwater. The soil was treated using Low Temperature Thermal Desorption. 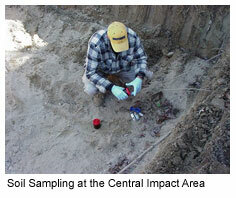 In addition to these actions, 270 monitoring wells were installed in the Central Impact Area and sampled. Sampling results identified a series of finger-like RDX, and to a lesser extent, perchlorate plumes with detections up to ~40 parts per billion (ppb) and ~4 ppb. The Groundwater Study Program recently released the Feasibility Study for the site, which outlines the various cleanup alternatives for the Central Impact Area. Click here to access it. A Remedy Selection Plan is available for this site. Click here for more information. The Central Impact Area contains critical habitat for several state-listed species.